Function and style combine with Regency's Soho Desks. 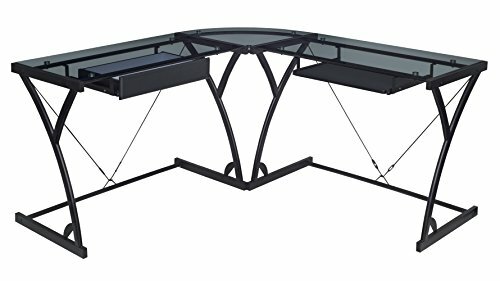 This spacious L-Shaped Desk is constructed of a stylish curved black steel frame with reinforced wire braces for extra stability. An 8mm tempered smoked glass top finishes this modern desk. A slide-out keyboard shelf and center drawer can be installed on either side of the desk. Modern and durable, this desk is the perfect addition to your home office. 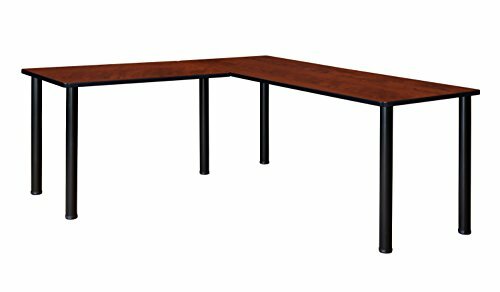 Fusion Desks bring a modern yet functional edge to any office or classroom. 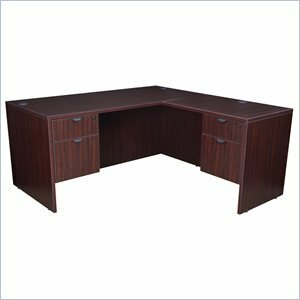 This 72-inch Double Pedestal L-Desk with 42-inch return is good looking and has amazing interior wire management capabilities. Black metal C-Legs have a vented compartment with removable cover that runs the length of the leg. Wires run from a power source on the floor through the legs and cabling cutouts in the modesty panel and up to desktops for instant connectivity. It includes one Box-Box-File Pedestal and one File-File Pedestal that can be installed on either side of the desk. The file drawers accept both letter and legal filing while the box drawers keep supplies handy. All drawers lock and have silver colored curved drawer pulls. The desktop is constructed of a thermal fused melamine Grey laminate that is 1-inch thick and finished with a black T-Mold edge band. Rounded corners make the desk safer for everyone. Laminates are scratch, stain and burn resistant and wipe clean easily. The legs and modesty panel are constructed of a sturdy metal with a stylish black finish to match any decor. Fusion case goods are backed by a 10-year limited manufacturer's warranty. Keep L-Desk shells are the framework for a complete office. Customize with pedestals, Hutches or other storage options. 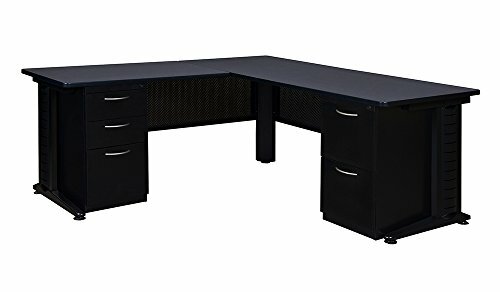 This classic 60-inch L-shaped corner workstation includes a 42-inch return which can be installed on either side of the desk. Keep post legs come in a classic black that complements the desk surface and matches any decor. Leveling glides on the Bottom of each leg are individually adjustable so you have a steady table with no wobble. Assembly is a snap with just a few screws to attach the legs to the desktop. 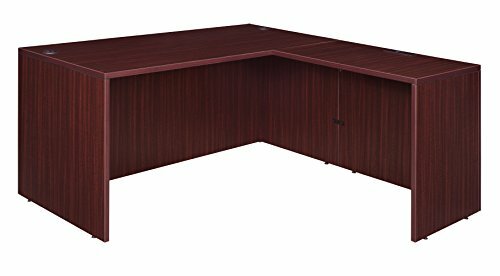 The desk is constructed of a thermal fused melamine cherry laminate desktop that is 1-inch thick and finished with a black T-Mold edge band. Laminates are scratch, stain and scald resistant and wipe clean easily. Rounded corners make the table safer for everyone. Keep l-desks are backed by a 10-year limited manufacturer's warranty. Versatility is just the beginning with so many Legacy desking options. This classic L-shaped corner desk is a great choice for professional and home offices alike. It comes with two box-file pedestals that each have one box drawer and one file drawer that accepts both letter and legal filing. All drawers lock and include ergonomically designed drawer pulls for convenience and ease in operation. Adjustable glides on the bottom of the base keep the desktop level and are easy to adjust. Wire management grommets keep cables clear of work areas. 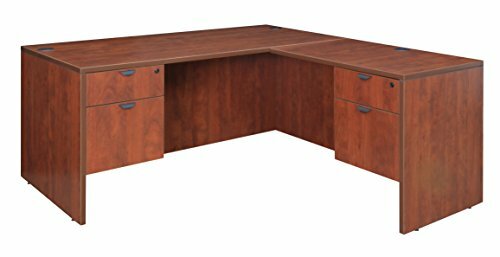 Finished in a classic Mahogany laminate, this desk coordinates with other Legacy furniture. The Legacy collection is constructed of a 1-inch thick thermal fused melamine laminate with a 3-millimeter commercial grade matching PVC edge. Laminates are scratch, stain and burn resistant. Legacy casegoods are backed by a 10-year limited manufacturer's warranty. Find your niche with the versatile and modern Niche collection. Simple, clean and compact, the Niche line is sure to please. The Niche Corner Workstation is as versatile as it is functional. Increase desk space and decrease neck strain by placing the monitor on the raised monitor stand in the back. Most 27-inch screens or smaller fit. Three attached open shelf bookcases keep supplies and resources handy. A hinged door one cabinet conceals personal items or anything else that should be kept out of sight. A limited-access drawer adds a finished look or can be used to store smaller items. Its rich dark Truffle finish shows subtle wood grain and is sure to please and coordinates with the rest of the Niche line. No tools LockDowel assembly allows pieces to simply snap together and lock into place for a sturdy, hassle-free build. No more searching for the right size screwdriver or dropping tiny screws. Just snap into place and go. Please note that attaching door hinges requires tools, but furniture assembles without. Less hardware and fewer small parts means less plastic packaging and less waste. Make Niche a part of your home or office today. Versatility is just the beginning with so many Legacy desking options. 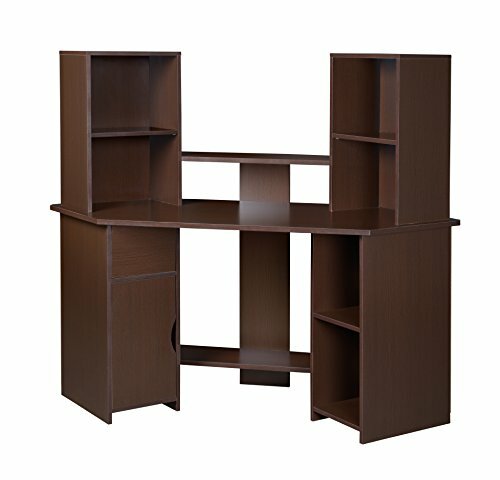 This classic L-shaped corner desk is a great choice for professional and home offices alike. It comes with two box-file pedestals that each have one box drawer and one file drawer that accepts both letter and legal filing. All drawers lock and include ergonomically designed drawer pulls for convenience and ease in operation. Adjustable glides on the bottom of the base keep the desktop level and are easy to adjust. Wire management grommets keep cables clear of work areas. Finished in an attractive Cherry laminate, this desk coordinates with other Legacy furniture. The Legacy collection is constructed of a 1-inch thick thermal fused melamine laminate with a 3-millimeter commercial grade matching PVC edge. Laminates are scratch, stain and burn resistant. Legacy casegoods are backed by a 10-year limited manufacturer's warranty. Legacy desk shells are the framework for a complete office. Customize with pedestals, Hutches or other storage options. 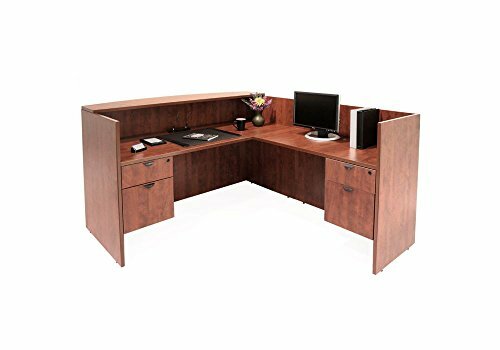 This classic L-shaped corner workstation includes an extra wide desktop and a 35-inch return which can be installed on either side of the desk. Wire management grommets keep cables clear of work areas. Adjustable glides on the Bottom of the base keep the desktop level and are easy to adjust. Finished in a classic Mahogany laminate, this desk shell coordinates with other Legacy furniture. The Legacy collection is constructed of a 1-inch thick thermal fused melamine laminate with a 3-millimeter commercial grade matching PVC edge. Laminates are scratch, stain and scald resistant. Legacy case goods are backed by a 10-year limited manufacturer's warranty. Looking for more Regency L-shaped Desk similar ideas? Try to explore these searches: Ball End Bit, Horn Knob, and Metal Upgrade Helicopter. Look at latest related video about Regency L-shaped Desk. Shopwizion.com is the smartest way for online shopping: compare prices of leading online shops for best deals around the web. Don't miss TOP Regency L-shaped Desk deals, updated daily.